Welcome to Marvel Strike Force Heroes page. This is the full description of MSF Thor stats, skills and abilities. Thor is an Avenger Blaster who strikes hard with his hammer and lightning. His first skill delivers heavy damage to the single target. His second skill deals medium damage to the primary target but has a high chance to chain to up to 9 adjacent targets. Thor ultimate deals medium damage to all enemies stuns the primary target and has 30% chance to stun all additional targets. His passive ability additionally increases his already high base damage. Thor strikes really hard but he is very slow for a blaster and that is the reason why you don’t see him often in other Arena teams. His price is 100 shards and you can farm him through Mega Orbs, Raid Orbs, and Raid Supplies. Thor is the God of Thunder who deals great damage and weakens multiple foes. 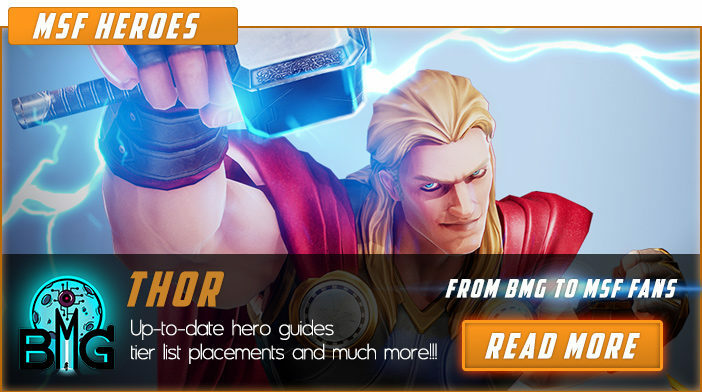 We hope that you enjoyed the description of MSF Hero Thor. For detailed information about other MSF Characters check our MSF Heroes page.